Two days of workshops between CMF and the UN Office of Drugs and Crime (UNODC) culminated with a meeting between Mr Yury Fedotov, Under-Secretary General of the United Nations, Executive Director of UNODC, and Vice Admiral John Miller, Commander, U.S. Naval Forces Central Command, U.S. Fifth Fleet, Combined Maritime Forces. (L to R) – Mr. Roberto Arbitrio, Chief of OED, Judge Hatem Aly, Head of UNODC for the GCC Countries, Vice Admiral John Miller, Commander, U.S. Naval Forces Central Command, U.S. Fifth Fleet, Combined Maritime Forces, Mr Yury Fedotov, Under-Secretary General of the United Nations, Executive Director of UNODC, Commodore Keith Blount, Royal Navy, Deputy Commander Combined Maritime Forces, and Commodore Daryl Bates, Royal Australian Navy, Commander of CTF 150. 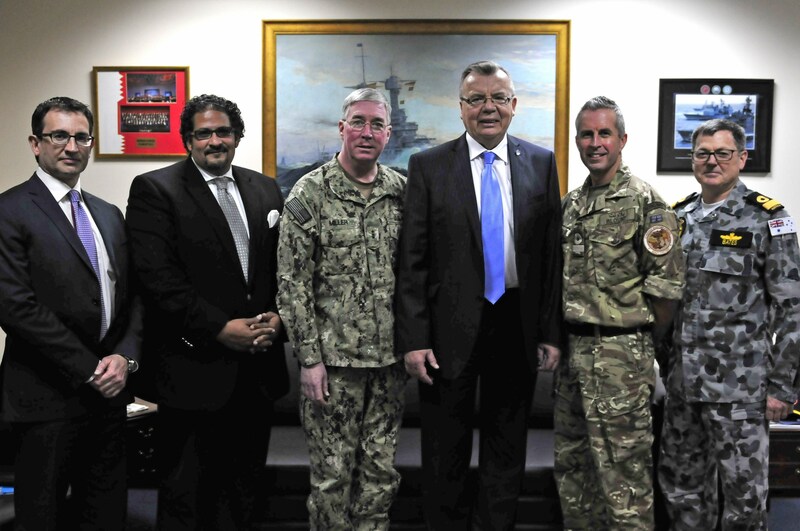 The workshops, at CMF headquarters in Bahrain, between CMF officers and UN representatives Mr Hakan Demirbuken and Ms Joanna Wright, were led by Commodore Daryl Bates, Royal Australian Navy, Commander of Combined Task Force (CTF) 150. They discussed the full breadth of challenges facing the effort to counter maritime transnational crime, including information exchange and how to garner regional state support for counter narcotics operations. Commodore Bates said: “Many countries are willing participants in counter piracy operations because of the clear mandate to take action under United Nations Convention on the Law of the Sea (UNCLOS) and other UNSCRs to tackle the threat to global trade.